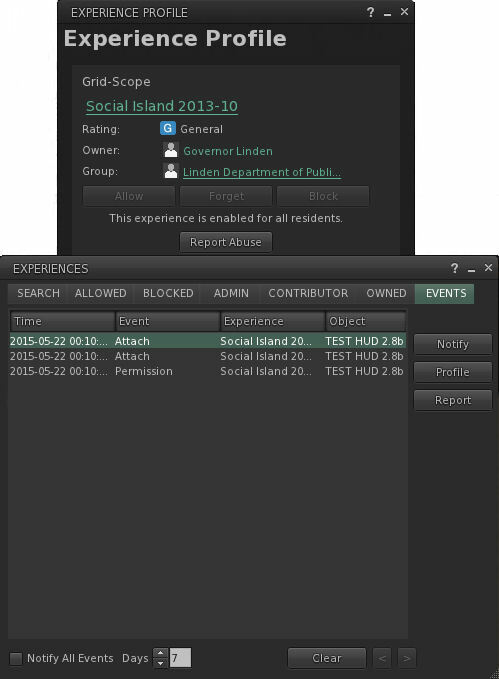 update, April 2016: The Lab is apparently A/B testing the use of Experience Keys with task-oriented learning at a set the Social Islands. See my article on this for further details. As a part of my periodic poking at things in Second Life, I recently logged-in using the avatar I keep “parked” at one of the Learning Islands which are the initial arrival points for new users, and noticed that the Lab has added Experience Keys capabilities to the first-time log-in experience for new users as part of continuing efforts to improve the experience new arrivals have when arriving in-world for the first time. For those not already in the know, and keeping things to their briefest, Experience Key (also referred to as Experience Tools) are a relatively new (and at the time of writing, yet to be fully deployed) feature that allow users to opt-in to an “experience” – which could be a game, a tour, an educational activity, and so on – just once, rather than having to repeatedly grant specific permission each time something wants to act upon their avatar – such as a teleport offer, attaching an object, etc. This means that the experience can be enjoyed much more fluidly and without the distraction of multiple dialogue boxes constantly popping-up. when the user leaves the experience area, their status in the experience is saved (e.g. their progress and items collected), all permissions are revoked, and all attachments removed. Within the first-time log-in environment, Experience Keys are being used to help guide new users through the basic steps of using the viewer. The focus (at least at the time when i noticed the use of Experience Keys) is specifically on avatar movement. However, there is no reason why the approach couldn’t be expanded in the future to cover other aspects of viewer use, and other aspects of gaining familiarity with SL. A key difference between the use of Experience Keys in the new user experience is that the HUD system is attached seamlessly when logging-in for the first time; there’s no initial pop-up dialogue box for the users to accept as they log in. This is a good idea, as it avoids potential concern which might otherwise occur for a new user in having a potentially confusing / worrying dialogue box displayed as soon as they log-in, stating it wants to take control of this and that. Instead, the HUD attaches, and a couple of seconds later, the first pop-up displayed, providing a brief, basic overview of walking and turning. In all, there are four pop-up hints given as the user progresses around Social island, each one appearing at an appropriate point in their travels. The hint on flying, for example, comes just ahead of the user reaching a broken bridge which should otherwise span a chasm. The process stops when the user passes through the portal leading to one of the Social Islands, with the experience HUD detaching automatically as they do. Once at the latter, things become more of the familiar mix (to those of us familiar with the new user experience, at least!) of potential confusion, wandering and poking at things in order to work out what to do, even with the help from established users, who have for a while now been able to access the Social Islands (and some of whom can themselves be somewhat unhelpful, and do act as an illustration of the Lab’s misgivings on this area). However, to stick with the use of Experience Keys, the current deployment is pretty basic, but it does offer a rough foundation on which more might be built. As such, I asked Peter Gray, the Lab’s Director of Global Communications about the use of the Experience Keys capability, and whether it might be extended within the new user experience. How this might be done is a matter of speculation; Experience Keys certainly offer a raft of opportunities for easy learning activities along the lines of the old Orientation Islands of yesteryear, but with a potentially greater level of engagement and interaction. As it is, the viewer does have a reasonably good introduction to the basics of using the viewer in the form of the How To guide (which has never seemed to really form a part of the various attempts to tweak the on-boarding process). It would be interesting to see the information this contains put to far better use, possibly as part and parcel of a more immersive, interactive means of guiding new users through the basics of the viewer utilising Experience Keys. Getting to grips with the viewer is, of course, only one aspect of bringing new users into SL and getting them to stick – and it is one perhaps we focus on a little too much. The key to getting people to stay is to get them engaged in the platform – and that comes through positive interaction with others, preferably by helping them to find people within environments and activities which interest the incoming users. This is perhaps a harder aspect of the problem to solve. However, as write Beau Hindman demonstrates in his recent video on the new user experience; there are options which might be considered. One in particular could be to direct incoming users more towards Experience Keys-led activities within SL, as more and more come on-stream, as it is likely these will tend to be something of a focus of established users as well, thus providing a potential mix of activity and interaction with others. It also fits with the Lab’s vision for on-boarding people in their Next Generation Platform. As noted above, what is currently employed at the Leaning Islands is rudimentary; but it is also a start. Experience Keys will hopefully be fully deployed across the grid in the near future. Once that’s the case, it’ll also be interesting to see how the various mentor groups might leverage them to help new users as well. Next Post RFL 2015: It’s Woodstock, Second Life style! One thing to note is that the HUD did not work on Firestorm when I was on Learning Island a few weeks ago. It was attached to my screen and would occasionally flash and fade in and out of view, but for those who may opt (on a friend’s suggestion or similar) to immediately log in with a TPV, they may not get the prompts that others on the LL viewer will see. I tried with the current LL release viewer, the Exp Key RC viewer (seen in the images) and Firestorm 4.7.1, and the prompts came up OK for me; although admittedly, I didn’t go further than just along the beach to see if the 1st prompt would appear in Firestorm before swapping to the Exp Keys RC – so curious. I still have a test avatar parked at Social Island for testing purposes (I also keep one parked at a Learning Island to see what may develop there as well), so will go back and have another play and see what happens. The several Lindens I’ve talked to have noted that the HUD you discuss is a bit buggy and doesn’t show up for all users. And I’ve mentioned to them that the first pop-up shouldn’t be “Avatar” but rather “How To” at this point in the new user experience. That’s interesting, and could be the problem Ever was referring to above. I didn’t encounter any problems going through Social Island a number of times with the LL release viewer & the Exp Key RC viewer, so curious indeed! And on How To – totally agree. That was long a trumpet call of mine 🙂 .